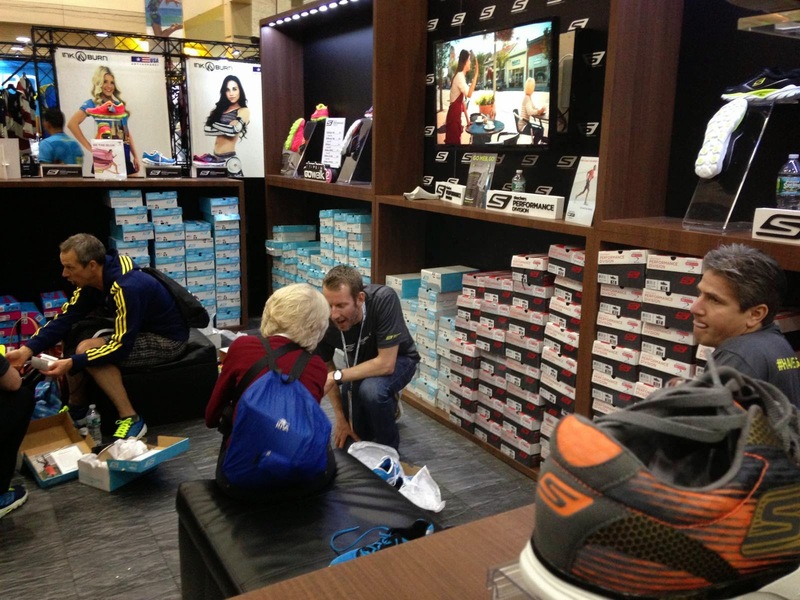 I really enjoy working at Skechers Performance Division booth at running expos like Boston Marathon and NYC Marathon. You really get a chance to connect with runners from all over the world, to hear their stories, how they qualified, and to tell mine and Skechers Performance Division story. At Boston I also got the opportunity to give runners advise on how to run the Boston marathon as I have a completed five Boston Marathons. I got questions about the Heartbreak Hill, how to run the first ten downhill miles etc. Its also very inspiring to fit runners in Skechers Performance Division shoes. Most of the runners had tried them before but some runners were not familiar with the brand and the fit. Its always a great feeling when you get that positive respond from the runners " WOW, this is actually a really great fit". Other runners came to the booth to ask for "the shoe that Meb use". An 80+ year old lady was one of those. She asked gently to try the shoe that Meb were going to use. She told her story about running and how she had to use old tennis shoes when she first started to run. Running shoes for women had never been heard of. As a woman she had also issues entering races at times. She was really impressed by the feel of Speed2 but wanted to wait a bit. During the end of our conversation, I gave the lady a Skechers Performance Division, "GO Meb Go" tshirt and she started to get tearful and thankful. Later that day, she came back and bought her first pair of GoMeb Speed2 and told me. "I wish Skechers had been around 40 years ago, you are all so helpful!" This time it was time for me to get tearful. This is what its all about, Giving Back! awesome post stefan - it's take me a few years but i've finally begun to find ways to give back to the running community this year, whether through group runs, pacing races or guiding a blind ultrarunner friend. you're absolutely right - this is a critical piece to the running puzzle! I saw that look in her face.. like she was mesmerized by all the shoes. I love how you took time to talk with her and she looked very happy when she left with the tshirt! You are a great salesperson.. I hope Skechers realizes that you would be a great asset to their sales team!